Accommodation-Rooms per night to Sunday to Thursday to $200 plus 12% (24.00) per night. Multiple nights 10% discount and if in Military another 10% discount. Friday and Saturday $250 plus 12% ($30.00) and if in Military 10% per night discount. 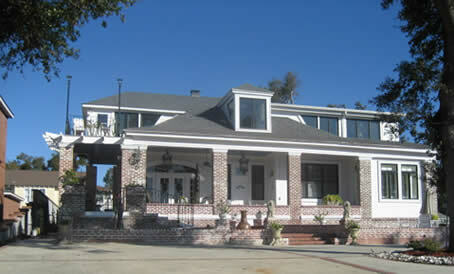 Valentine and Mardi Gras Specials - $200 per night plus 12% tax. Military 10% discount apply to room rate. Special breakfast menu and champagne served. All occupancy rates are subject to change. In Room-Heat and air conditioning, Cable TV, CD player, alarm, clock, coffee/tea facilities, hairdryer and turndown service, private bath/shower, and private entrance. On Site – Video Security, library, internet, telephone and an antique Steinway Baby Grand piano. Children under twelve and pets not permitted. A full gourmet breakfast is included with room rate. Breakfast is served from 8:30am Mon-Fri, 9 am Sat-Sun. Breakfast menus features locally caught seafood, traditional country style meats, local farm eggs and produce. Smoking is allowed outside on porch and patio. One night deposit (non-refundable) required (Reservations must be guaranteed with a credit card or personal check, Visa, MC, Discover accepted). Reservation Age Restrictions - Persons reserving and occupying a room must be at least 21 years of age, except for active duty Military personnel. Valid identification required to register. Cancellation: Five (5) days/120 hours – Cancellation fee equal to deposit.